Heath snatched a 21-21 draw in a dramatic finale at Moortown to stay third in Yorkshire One, now behind York and Beverley. They were facing defeat when their Leeds hosts took a 21-16 lead with four minutes left but big forward Seiffe Boussaada was driven over the try line from the last play of the game. Ezra Hinchliffe’s conversion to win the contest went inches wide but a draw was probably a fair outcome. Heath had beaten Moortown at North Dean in September but the Leeds side had improved since and went on the attack from the start. They missed a third minute penalty but scored an unconverted try in the corner on 10 minutes as Heath struggled to come to terms with the pace of the game. Eddie Cartwright went on a run and released Callum Harriett-Brown, who was halted by the Moortown defence at the expense of a penalty. Hinchliffe found touch 15 metres from the home line but Moortown turned the ball over and cleared. The visitors were now in control with Ian Downsborough and Chris Moore making ground. Matt Beasty and Alex McFadden set up the next play and after constant pressure Jordan Bradbrook broke free to score under the posts. Hinchliffe’s kick gave the visitors a 7-5 lead after 18 minutes. The game was developing into a real battle, with Jason Merrie and Boussaada in the thick of things for the visitors. Hinchliffe increased the lead to 10-5 with a 25th minute penalty but Moortown slotted a three-pointer of their own shortly after. A clever kick from Jack Crabtree put pressure on the home side who gave away another penalty. Hinchliffe’s attempt was short. 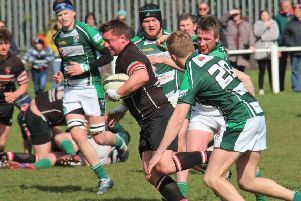 Moortown began the second half on the attack and scored in the corner to take a 13-10 lead on 48 minutes. Heath’s response was again immediate, Hinchliffe’s easy penalty making it 13-13. Moortown’s marksman and Hinchliffe traded penalties for 16-16. Excellent work from Alex McFadden released Boussaada and the supporting Harriett-Brown was bundled into touch with the try line in sight. Moortown were defending well and breaking quickly as the game ebbed and flowed. They looked to have won the game with their late try, but Heath would not lie down. Moortown had a player sin-binned and from the penalty Hinchliffe found touch 10 metres out. Boussaada won the lineout and the whole Heath team were involved in a rolling maul to get him over the line. Leaders York beat second-placed Scarborough, who dropped to fourth with Beverley jumping up two places.